Compound interest is the money you earn on your bank balance, plus the interest that money earns. It is a way to make your cash work for you. How fast your account balance grows is determined by your interest rate, bank balance and the number of times your bank compounds, or pays interest, on the account. Say you put $3,000 in a savings account with an interest rate of 1.75% a year, and your account compounds interest monthly. After one year, your balance would be about $3,053. So your money would grow $53, without the need for any additional deposits. For the next 12 months, that $53 will continue to earn interest, along with the original deposit of $3,000. Without touching your account, you would have about $3,107 at the end of the second year. » Want to see how fast your own savings could grow? 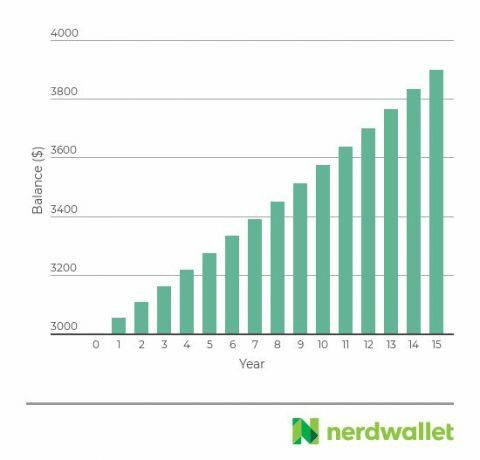 Use the NerdWallet compound interest calculator. Compound interest is a feature you can take advantage of as long as you have an account that offers a return. Here’s a look at how the balance on the above account would grow over a period of 15 years if the interest rate stayed the same. You’ll want to find the best interest rates. The national average rate for savings accounts is currently 0.10%, but some institutions consistently offer above-average rates. Many online banks, for example, offer rates close to 2%, meaning your money earns more than 10 times the national average. The total return over a year is called the annual percentage yield, or APY. The higher your account’s APY, the faster your balance can grow. Many banks reserve the right to raise or lower the interest rate on a savings account at any time. If you want to put your money into an account that compounds interest at a rate that won’t change for a guaranteed time, consider opening a certificate of deposit instead. Read NerdWallet’s primer on what a CD is to learn more. You could also take advantage of higher-return investments, such as stocks. Returns are not guaranteed, but stocks have historically had higher yields than savings accounts over time. Those returns can benefit from compound interest, meaning more growth for your money. » Wondering how to get started with the stock market? Read NerdWallet’s primer on how to invest in stocks. Simple interest is calculated once, but compound interest is calculated over multiple time periods. In the example above, the $3,000 balance earns close to $53 in the first year because the bank account compounds once a month or 12 times a year. The ending balance is slightly more than the simple interest calculation of 1.75% of $3,000, which is $52.50. The more an account compounds, the more it earns. Many online savings accounts compound daily, including those offered by Marcus by Goldman Sachs (read review here) and American Express (read review here). To determine monthly compound interest for 12 months, you can use the formula b(1+r/12)12, where “b” is the starting bank balance and “r” is the interest rate. An easier way to calculate how much you can earn is to use the NerdWallet compound interest calculator. You can choose what your balance would be over different time periods, and factor in additional deposits to your account. Compound interest can help supercharge your savings. It is effectively interest on interest, and it can give your bank balance a nice boost over time.